The Bulldog WD26 is an American made commercial floor scrubber created to handle the toughest applications. 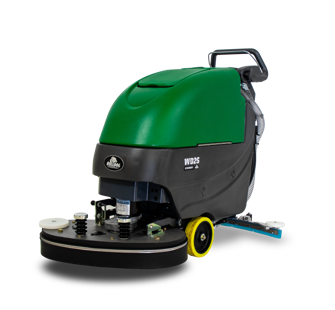 The WD26 is equipped with two 13 inch disk brushes that are offset from each other in order to avoid any brush lines on your floor. Bulldog machines are very easy to use as well as reliable and affordable. Save lots of time by scrubbing up to 35,000 square feet per hour with the Bulldog WD26.